Federal High Court, Justice Abdul Kafarati. had initiated a legal process to proscribe the group. South-South regions of Nigeria amount to acts of terrorism and illegality. same in the official gazette and two national newspapers. compliance with Section 84 of the Evidence Act of 2011. Litigations, T.A. Garali and Oyin Koleosho. Abdu Kafarati, granted all the orders and proscribed IPOB. The judge ruled: “That the application by the AGF is granted as prayed. amount to acts of terrorism and illegality is granted. name of platform however called or described is granted. judge this 20th day of September, 2017. Registrar and another Registrar, Prince Babatunde Adejoro Ashada. Buhari had approved the process for proscribing IPOB. Buhari and that the group is being sponsored by some foreign countries. 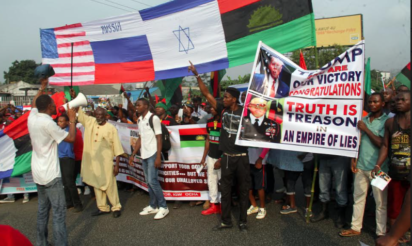 clear to IPOB that it has no support for its violent campaign. banned the activities of IPOB, who then is the organization fighting for? East. Even a dictionary definition of ‘genocide’ does not support that claim. for arms and for funds. 1983 there was a group called Maitatsine in Kano. the social media has not helped things. That would have set the entire country ablaze. work on it and we must continue to counter this very untrue narrative. said yesterday, there are about 11million Igbos living outside the South-East. Nigeria is now involved in trying to quell unrest, will the courts be spared? going to jail will try and cause confusion, he would go and support IPOB. from some foreign countries; this is clear. to block the sources of finance, that is what I said recently. a few very naughty diplomatic issues which you need to skip. for them it’s about freedom of expression. UK, what would you think of, would you consider that freedom of expression?